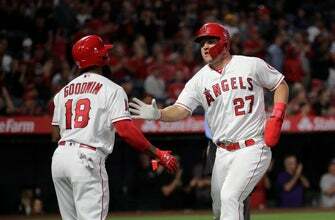 CHICAGO (AP) — Angels center fielder Mike Trout is scheduled to see a doctor in Southern California on Friday about his strained right groin. Manager Brad Ausmus said Trout could rejoin the team in Chicago for its series against the Cubs or wait until its next series in Texas. Trout signed a record $426.5 million, 12-year contract near the end of spring training. The two-time AL MVP is batting .406 with five homers and 12 RBIs in 12 games this year. Ausmus also said he thinks Shohei Ohtani is going to hit off a machine Friday. The 2018 AL Rookie of the Year had Tommy John surgery last October. Ohtani has been taking batting practice for a couple weeks. “It’s a baby step up,” Ausmus said. The 24-year-old Ohtani isn’t expected to pitch this year, but he could return to the Angels’ lineup in May.